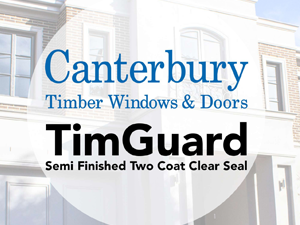 When purchasing timber windows and doors, you can’t go past TimGuard, our semi finished two-coat clear seal, for superior protection. TimGuard is an innovative timber sealing solution exclusive to the Southern Star Group. Separating TimGuard from the competition is that the system applies two coats in factory and 2 coats on site. This four-coat total is often twice as much as traditional systems offer. Canterbury Timber TimGuard semi finished two-coat clear seal is unique to the Southern Star Group and is the best way to ensure superior protection for your timber windows and doors.